Do you want the the family name engraved on the back of the monument? This gives greater visibility for locating it in the cemetery. You can also have additional inscriptions on the back or the names of your children if you like. Will you want to have vases installed with the monument? There is a wide selection of vases from which to choose. If you would like to see some samples, please click HERE. There are also other accessories you may be interested in such as; porcelain portraits, bronze ornaments, memorial lights, etc. What are some things to consider when personalizing a monument? What is the average time it takes to complete a monument? 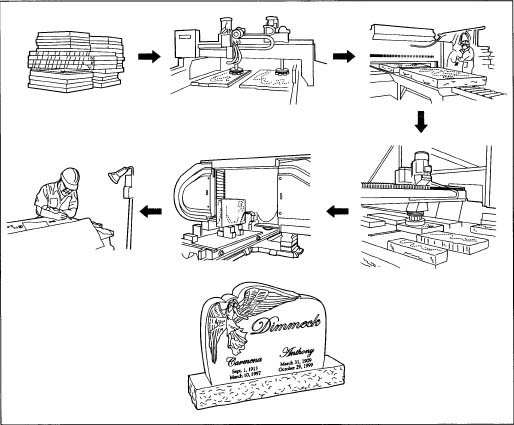 Depending on style and granite color, as well as design options (such as an etching) your monument can take as little as four weeks to complete, or for a special order, as long as six months. Popular granite colors and sizes as well as current specials are often already in inventory and can be delivered often within a few weeks. In all cases, orders can only be set in a cemetery when the weather permits. 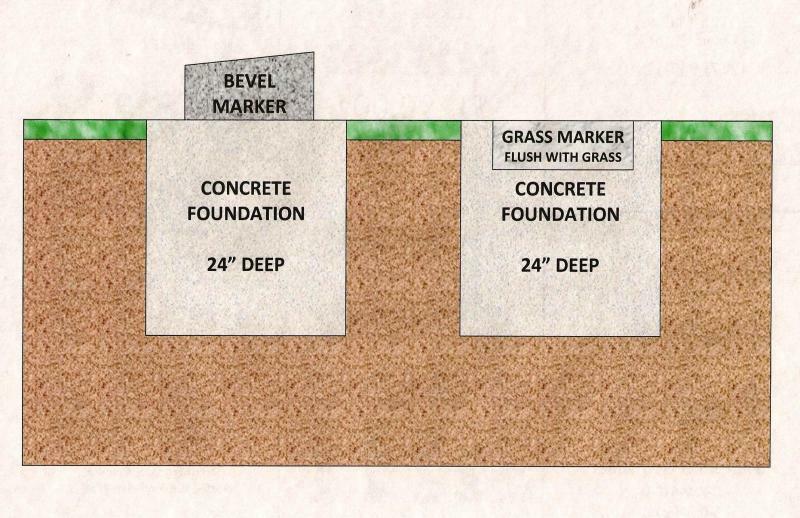 We cannot pour foundations during the winter months, so a monument ordered in late fall or winter would be installed in the spring. Ordering granite ~ granite must be ordered, depending on type, from different suppliers who have to deal with inventory, production and shipping concerns over great distances. Many types of granite are only available from countries overseas such as China and India. There are so many combinations of colors, sizes, shapes and finishes for granite, that it would be impossible to keep all of the options in stock. Imported granites coming from the outside of the United States, take approximately 160 to 180 days to deliver. Design work ~ it takes time to design, layout and prepare stencils. Everything must be checked and rechecked; questions resolved, approvals received and adjustments made. Shipping ~ sometimes shipping can be delayed until full loads can be assembled. Field work & scheduling ~ locations at the cemeteries must be determined and staked by authorized persons according to their own schedules. 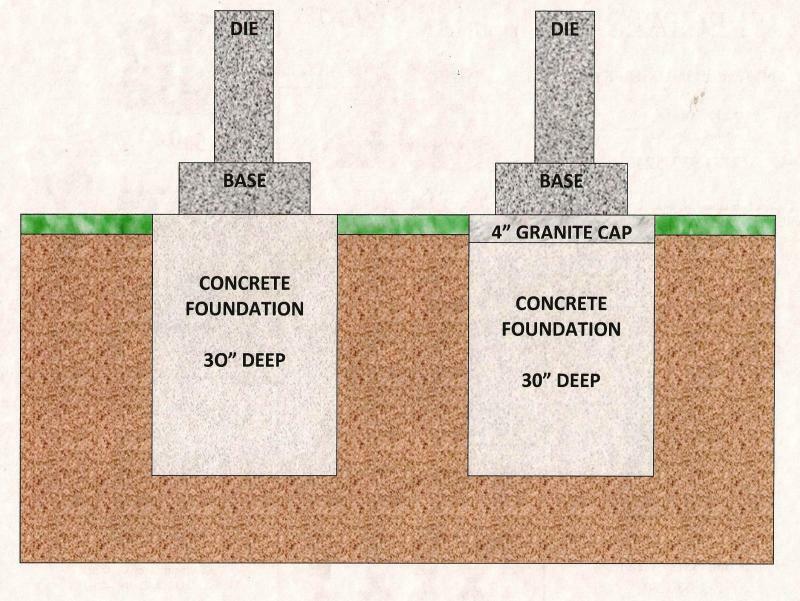 Concrete foundations must be poured and allowed time to cure (ideal temperature must be at least 40 degrees). Inclement weather and funerals can affect scheduling, which we try to schedule by type and region on a regular calendar basis which may not be exactly in the same order as the purchase dates. If a monument is required earlier, please indicate that this is a special order. We will advise you of any additional fees that may apply for a rush delivery. Why aren't all granites the same price? There are a number of reasons why granites differ in price. There are currently over 20 different colors available. Many colors are quarried in the United States while others are quarried as far away as Norway, India & Africa. When a block of granite is removed from the ground, there is a certain amount that is normal waste. With some granites, the waste factor is much larger and obtaining good clear pieces becomes a problem, so the price is higher. Still others are harder to polish, hence a higher price. Blue Pearl which is quarried in Norway, is only quarried and produced two months out of the year. This greatly limits availability. The opposite is true with Georgia Grey as this color is in great abundance. It's not a lesser quality granite; there is just more of it available. Should I make pre-arrangements to purchase a monument? There are many reasons to purchase your monument before the need comes. Although no one wants to think about their own death, failure to do so makes it much more difficult on the bereaved family. By being able to pre-plan without the stress of recently losing a loved one, you will relieve an emotional burden to your family. Choosing a family memorial should be a joint decision – not one that is made alone. By planning ahead, you can select the style, size, and color you prefer. A personalized design that you helped create can reflect your beliefs, values and interests. Rather than have your family confused over what you would have wanted or what is appropriate, you can save the family from having to decide what is the right thing to do for you. As a practical thought, you can save money. Purchasing a monument before the need arises means that you are utilizing today's dollar. Like everything else, it will cost less now than in the years to come. You can select what you are financially comfortable with at today’s budget without financially burdening family when you are gone. Please note ~ the pricing for the final date lettering of a pre-need monument is not included in the original purchase price of the monument. Monuments can become dirty or stained by air pollution, hard irrigation water, tree sap, birds or any number of other sources. Be sure to use lots of clean water. Do not use a pressure washer or strong chemicals / soap. 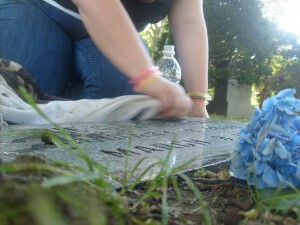 Any abrasive or acidic cleaning agents can easily damage headstones with a glazed finish. (For bronze markers, there are special cleaning kits available from monument supply companies). How is a monument made? Copyright 2014 Safford Monument Co.. All rights reserved.